Property Info: 4 BR, 3 BA beachfront condominium with 1900+ sq. 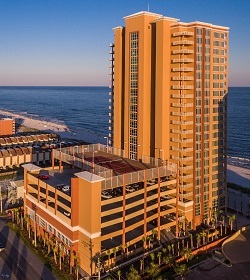 ft.
Phoenix luxury gulf-front condominium home for sale, Gulf Shores Alabama Real Estate. This beautiful 4 bedroom 3 bath condominium sold furnished and decorated with exquisite taste. The view from the east corner unit is breath taking with a private balcony This condo will be turn key, rent ready. Owner storage on the same floor in the hallway. The owner has made additional upgrades to the pre-construction options. The floor has wood design ceramic planking with granite throughout, 10' ceilings, floor to ceiling glass, tall cabinets to fur down, stainless steel appliances, Gulf front Master bedroom, wet bar, and many more upgrades. Enjoy the amenities that include an outdoor. a zero entry pool with a slide and a large indoor pool, fitness center and tennis court. Poured in place, solid concrete exterior. Poured in place solid concrete petition wall between each unit. Come see this resort home at Phoenix Condos in Gulf Shores AL.